The concept of finding anything positive about palmitic acid is still tantamount to research suicide. However, stearic acid is a rather different matter. It's lipid "neutral" for those poor folks who still bow their heads and kneel before the altar of the lipid hypothesis. So you can publish good stuff about stearic acid with relative impunity. Raymond sent me the PhD thesis of Valerie Reeves, Kentucky University. 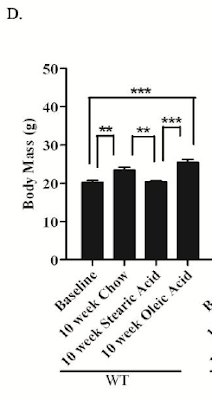 Reeves, Valerie Lynn, "A DIET ENRICHED IN STEARIC ACID PROTECTS AGAINST THE PROGRESSION OF TYPE 2 DIABETES IN LEPTIN RECEPTOR DEFICIENT MICE (DB/DB)" (2012).Theses and Dissertations--Physiology. Paper 3. 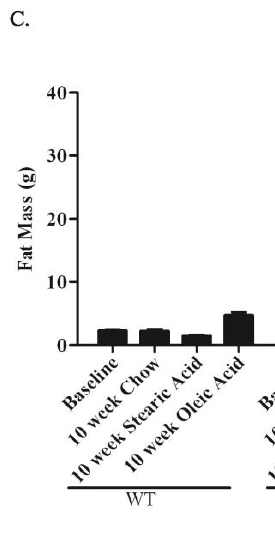 What happens if you feed a fairly typical C57Bl/6 mouse 40% of its calories from fat, based on fully saturated stearic acid? They stay significantly slimmer than they do on CIAB (chow) and probably slimmer than when fed on 40% oleic acid (olive oil w/o the PUFA). The wild type control mice were so nice in this PhD thesis that I thought I'd just put up these few figures before we consider what might happen if (gasp) you put an obese, diabetic db-/- mouse on a highly saturated stearic acid based diet. The first person I came across doing this practically was a LC blogger back in my early days (probably 2002-ish) and I didn't realise why she was LC eating to manage her chronic lung disease, from the metabolic perspective. 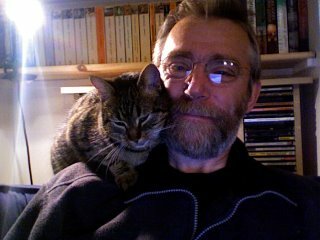 She was very focused on saturated fat, obviously (with hind sight!). I've not been through the above link's full text but you all know the depths of stupidity of most saturophobes. If this was corn oil and MCT based... Perhaps we could get a significant O2 consumption drop given some butter, dunno. Nice to see some medics taking this seriously! With apologies to whoever put this up on Facebook, one of those saved links but no idea who it came from. Anyone who has read through the Life series will know that I have a great deal of time for reduced FeS moieties as the core energy source used during the transition between pre-biotic chemistry and something resembling life. Bottom line: An electron from a reduced FeS moiety is able to reduce dissolved CO2 to a Ni bound CO- group using molecular hydrogen. 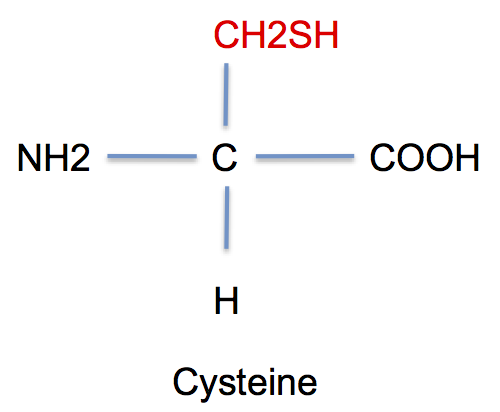 If you supply a couple of geochemical CH3-SH molecules you can then generate acetyl-SH, precursor to acetyl-CoA, from this Ni-CO. After that it's down hill all the way to metabolism. This is where the watchmaker comes from who is going to make the watch which you might find in the jungle. One of the earliest biological problems was to detach this reduced FeS from the inorganic cell wall and make it mobile. The solution is ferredoxin. 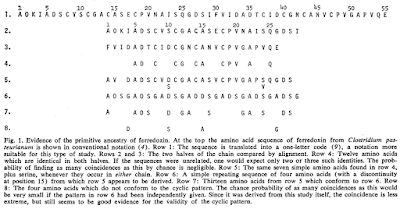 People have looked at the ferredoxin used by those bacteria which have done well for several billion years by developing the form of metabolism most closely allied to this very basic pre biotic chemistry. 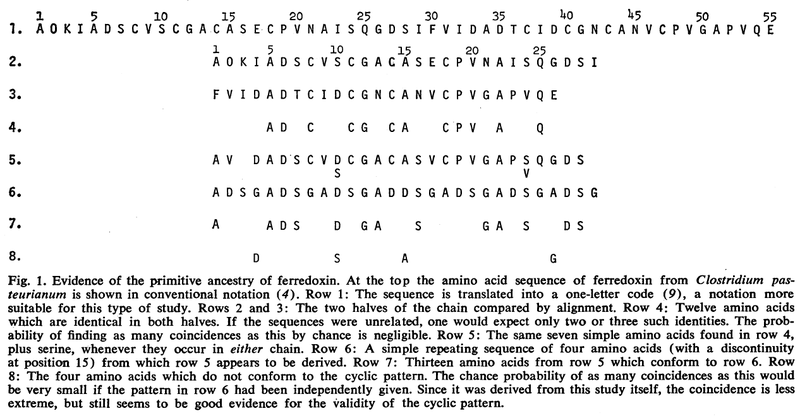 One of these ferredoxins was sequenced very early in the 1960's, while I was just a kid playing in the streets of Nottingham and Mike Russell (thanks Jack) had just gained his geology BSc from London University. I found the paper and its proposals fascinating. They are talking about concepts which fit extremely well in to Mike Russell's ideas about hydrothermal vents at a time before there was any evidence that the vents existed. As far as I can tell it has no bearing on anything we might do today but I still like it. It says a great deal about where we might have come from. Again from dissertante's query: How can chicken be found to raise blood glucose, acutely? Many years ago, as a beginner at treating diabetic animals, I tried to balance insulin dose rate/timing against carbohydrate intake. Owners always asked if there was anything they could feed as treats etc. I used to suggest meat and fat as they shouldn't need insulin for processing. This was a mistake. Dogs are, by the time we diagnose them, functionally type 1 diabetics. While fat is perfectly OK, protein certainly isn't. Eating protein, for a type 1 diabetic, produces an immediate rise in blood glucose. 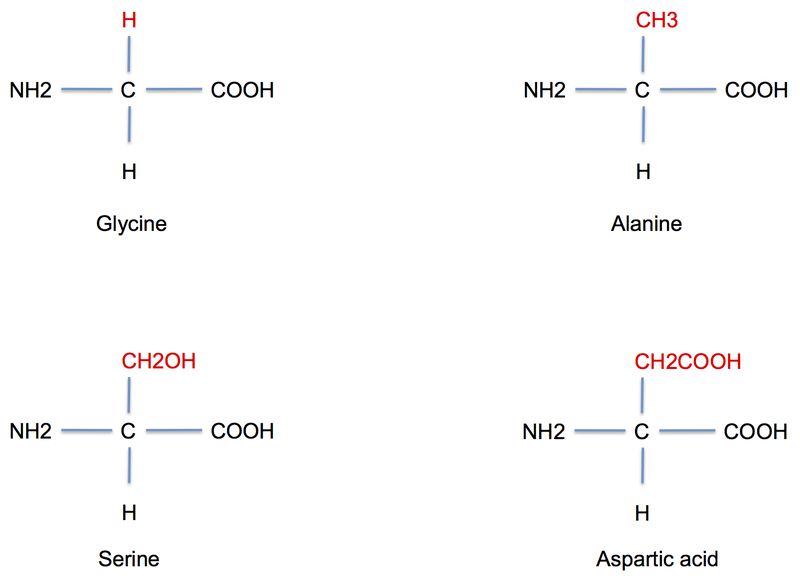 This is nothing to do with gluconeogenic amino acids, the effect of which would expect to be delayed for several hours, if it occurs at all. 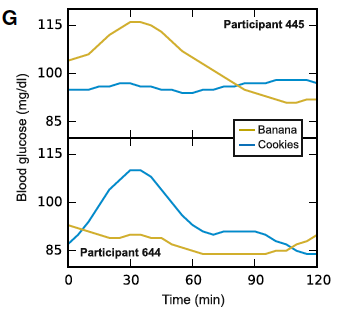 While protein for an normal human being/animal is neutral on systemic blood glucose it never the less produces an immediate spike (by around 60 minutes) in blood insulin. 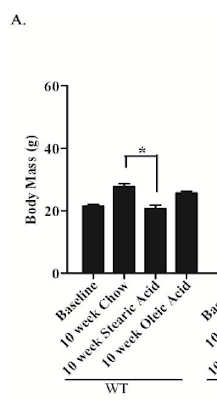 Eating 75g of casein protein more or less triples your blood insulin level but doesn't budge blood glucose down any more than cream does, which leaves insulin pretty well alone. 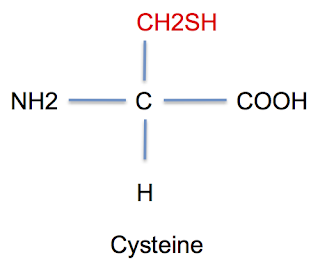 Under normal conditions the casein induced spike in insulin is counterbalanced by a rise in glucagon. If the insulin rise does not occur (through beta cell failure) the glucagon will still rise and is unopposed, so hyperglycaemia is the net result, coming from a rise in hepatic glucose output. This took me years to realise. Slow, I know but ah well.... It's now common knowledge and Dr Unger's glucagonocentric view of diabetic hyperglycaemia makes a great deal of sense. So protein will provoke hyperglycaemia in the absence of an insulin response, via glucagon, in a type 1 diabetic. I would guess that the same would apply to an advanced type 2. It very recently occurred to me that an elevated blood glucose after protein intake might be a useful supplementary test for certain oddities in OGTTs. I had an email a few weeks ago about OGTT results in long term, non diabetic low carb eaters. I don't know the exact details of duration of LC eating or the period of carb loading before the OGTT, but the end result after glucose ingestion was a sustained hyperglycaemia with profoundly depressed C-peptide levels. The worry here is that long term LC might have led to endocrine pancreatic insufficiency. My initial thought was to wonder what the response to exogenous insulin might be, but this was probably the wrong line of thought. What would be far more interesting would be to run an oral protein response test, looking at blood glucose, insulin, glucagon and C-peptide. Although, at a pinch, all you need is the blood glucose result. If a person has developed a significant loss of beta cells then the unopposed alpha cell glucagon response to this protein would produce hyperglycaemia. A normal insulin reaction in response to protein would produce normoglycaemia after said protein load. We all know that after a month or two of LC eating that three days at 150g/d of carbs will restore a normal response to glucose. But the question is what time scale of carb loading is needed after several years of LC eating. The regulation of insulin secretion in response to glucose requires active glycolysis, regulated by glucokinase in the pancreas. Glucokinase gene expression is controlled by dietary glucose supply. If long term glucokinase down regulation takes longer than a few days of carbohydrate loading to reverse, this would produce intolerance to glucose but would have no effect on insulin secretion when driven by amino acids. It would be quite simple to differentiate between down regulation of the pancreatic glucose sensor from newly acquired type 1 diabetes during LC eating. Summary: Elevated blood glucose after an oral protein load suggests genuine diabetes. Poor responsiveness to glucose after sustained LC eating simply reflects a mothballed glucose sensor, provided response to protein is normal. If normoglycaemia is bought at the cost of hyperinsulinaemia, it's not particularly attractive, to me anyway. Banana, cookie, who cares? The only way I can see that either of these is acceptable as food is if they are taken by the gut bacteria, converted to short chain fatty acids and so bypass the whole insulin/glucose signalling system. Many people seem to be happy to trust their health and glycaemic control to their gut bacteria. It takes all sorts I guess. So, the implication is that we can use this massive level of investigation to make choices between carbs which spike glucose and carbs which don't. For us, on an individual basis, tailored nutrition. 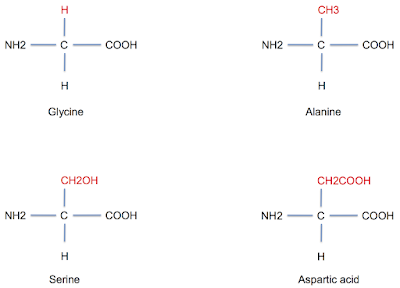 Without any idea of what these given sources of carbohydrate do to an individual's insulin levels. But, to be quite honest, it's junk vs junk anyway. "The PDP [partial dependence plots, part of their model] of fat exhibits a beneficial effect for fat since our algorithm predicts, on average, lower PPGR [post prandial glucose response] as the meal’s ratio of fat to carbohydrates (Figure 4C) or total fat content (Figure S5A) increases, consistent with studies showing that adding fat to meals may reduce the PPGR (Cunningham and Read, 1989). However, here too, we found that the effect of fat varies across people". Fat cannot reliably save us from carbohydrate induced hyperglycaemia. 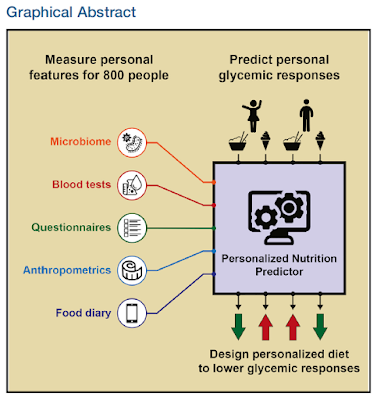 We still need personalised nutrition, even if we eat fat. But what if we eat only fat? What would be the glycaemic response to 100ml of double cream, drunk on its own, for breakfast? Drinking cream alone mildly reduces insulin after a transient rise and point blank drops glucose throughout the study period. There may be minor individual variations in response but these are all contained within standard deviations which narrow with time after exposure... There is little scope for a pathological rise in glucose or insulin within those SDs. The simple approach to personalised nutrition is to eat fat, cut out the middle man of our microbiota, limit glucose and reduce signalling through the insulin pathway while eating just enough protein to meet our needs. Anything else is going to need an awful lot of laboratory investigations to even get half the information we need to keep our blood glucose levels remotely normal while still using unknown amounts of insulin. Oh, dissertante also mention that, for some people, chicken came through as a "bad" food in terms of post prandial glycaemia. That's another post I guess.